Grandpa's Sweetheart(s). Father's Day cannot get any better than this. I Got The New Updated iPhone 3G S! Of course my life won't be normal unless I have the latest iPhone. I'm such a pathetic Apple fanboy. So far I have tested the video only and it really looks good. Not HD quality like my Mino HD camcorder but great for just internet stuff and maybe MMS later on. I think I will sell the Mino sometime. I sold my current iPhone 3G for $300 so it only cost me $100 to get the new 3Gs. When the going gets tough, Mama Dawn gets going. We've been watching the webcam live stream every day and many times we've been talking at the computer screen specially when Hannah starts crying and almost immediately we see Mama coming to the rescue aka diaper call. Well this weekend we're just going to have to be there to be part of the hysteria. 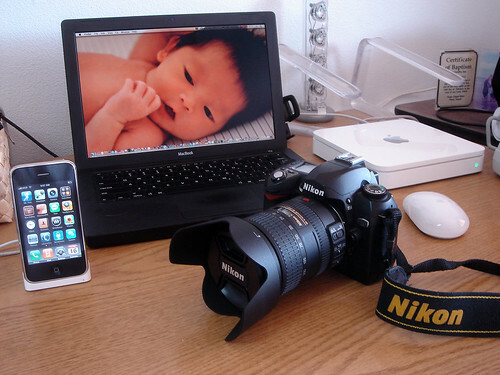 So I Bought A $700 Nikon 18-200mm Lens for the D70, Now What? When I received the Nikon D70 camera from Art & Hermie Carino, I was like another kid that just got an awesome toy for Christmas. So being the "obsessive-impulsive-compulsive" type that I am, I wanted to be an "expert" like yesterday. In just over two weeks, I probably visited all the internet sites about Digital SLR photography and have now read three books: Digital Photography by Scott Kelby, Better Photo Guide to Digital Photography by Jim Miotke, and Nikon D70 Digital Field Guide by David Busch. Right now I'm engrossed with a fourth book, Understanding Exposure by Bryan Peterson and I think this is the best one for newcomer-shutterbugs like me. It's just awesome. So what's next? Well, its time to get the hardware out and start shooting like a maniac. I got the tripod, lens filter and hood, and I got the time (yes!) so I will just go out there and practice, practice, and practice! If you're in Maui and notice a short old guy with a camera hanging from his neck at the shopping mall, that could be me. Tomorrow, I might get out at 5:30 am and shoot a few frames at Iao Needle Lookout or at the beach just before sunrise. Well, maybe. I'm just tired of taking pictures of the stray cats and their kittens that hang out in our front yard. The plan is for me to use this camera for now (compliments of Art & Hermie) and see if Photography hobby is a good fit in my retirement life and if it is, I would buy my very own camera. My mind is already set on one of the upcoming new Nikon models, the D300S or D400, that are to be introduced sometime in November, 2009 and rumored to cost around $2,000- $2,500. I'm going to pray that they will not be out till 2012!